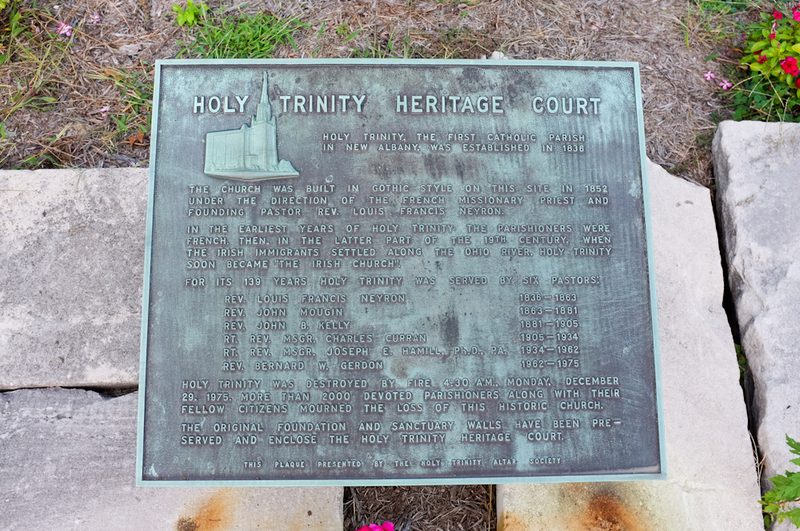 Dedicated in October 1977, the Holy Trinity Heritage Court commemorates the history of Roman Catholics in southern Indiana. The court marks the site of the former Holy Trinity Church. 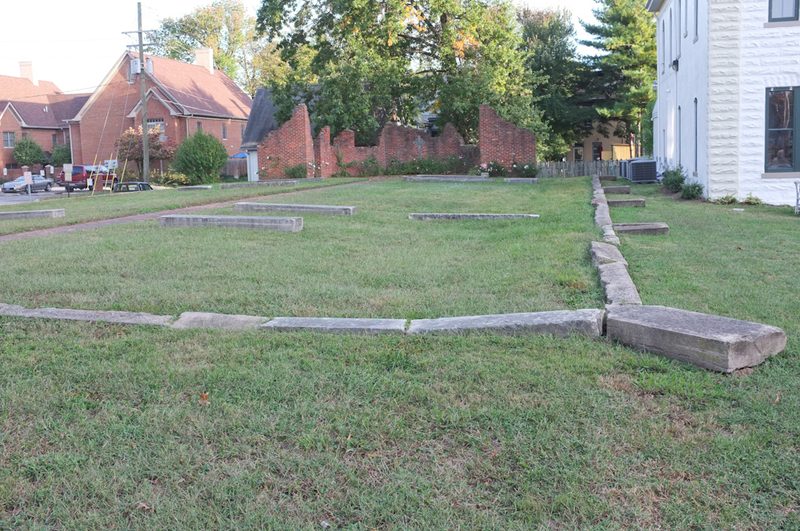 The court includes portions of the original brick foundation of the church and two bronze bells. Fire destroyed the church on December 29, 1975. Holy Trinity Heritage Court is a a site of remembrance, celebration, and pilgrimage for Catholics in southern Indiana. 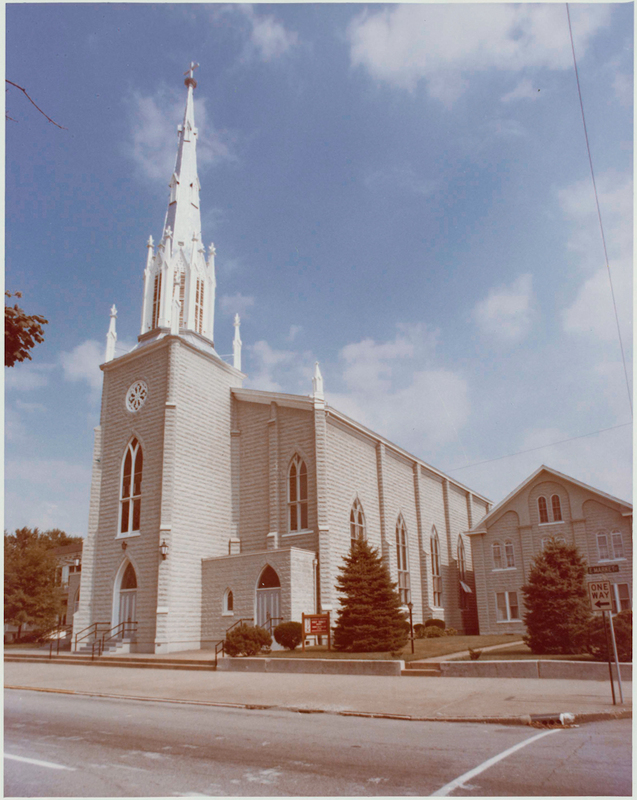 Holy Trinity Church served as the first of four Catholic parishes in New Albany. 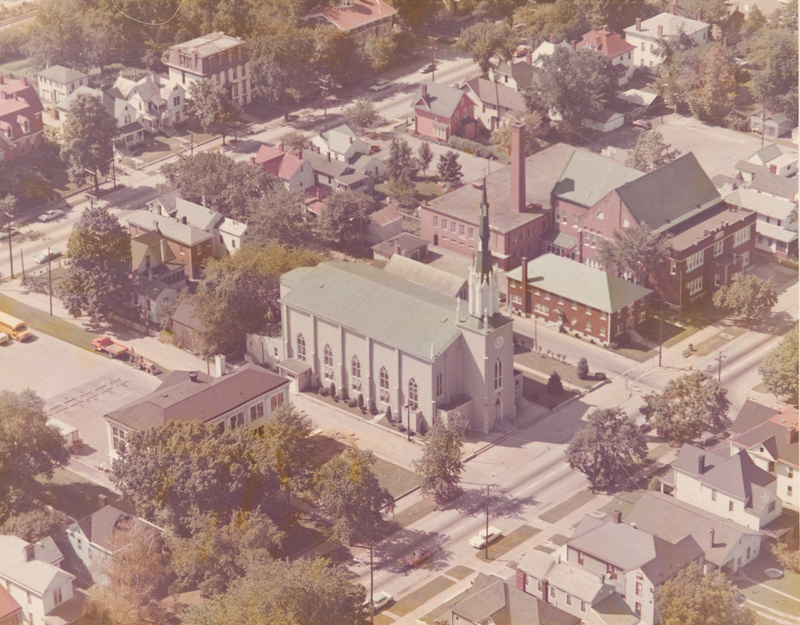 The site of the church has been an anchor of Catholicism in New Albany since 1837, when Father Louis Neyron purchased the lot and had a small one-story structure built on the location to offer mass. 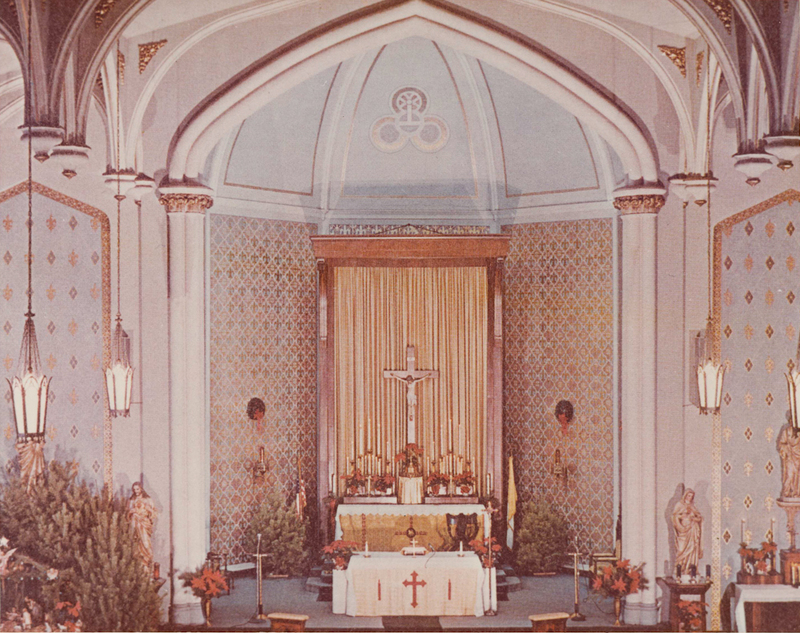 As membership grew, parishioners developed plans for the construction of a brick church. Tensions between Irish and German parishioners resulted in a split. 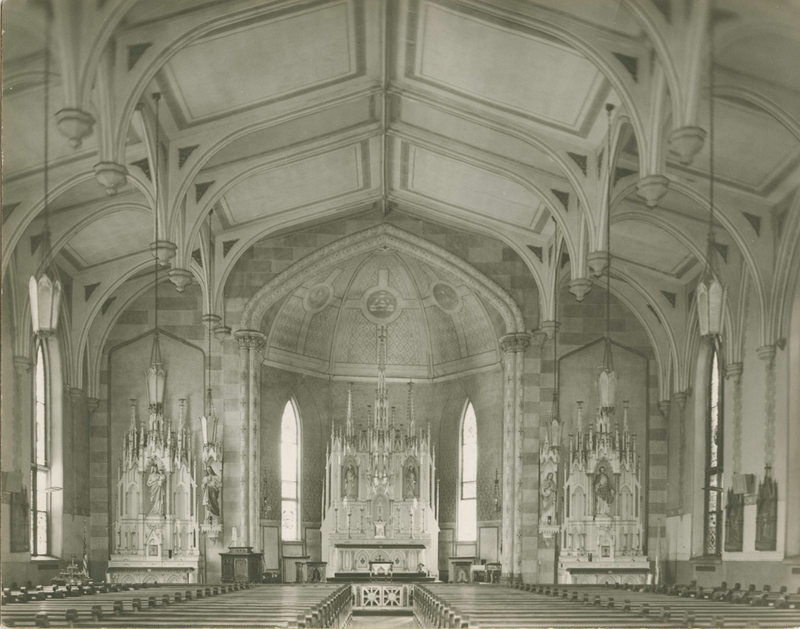 When completed in 1852, the Gothic-style church building served the Irish members. 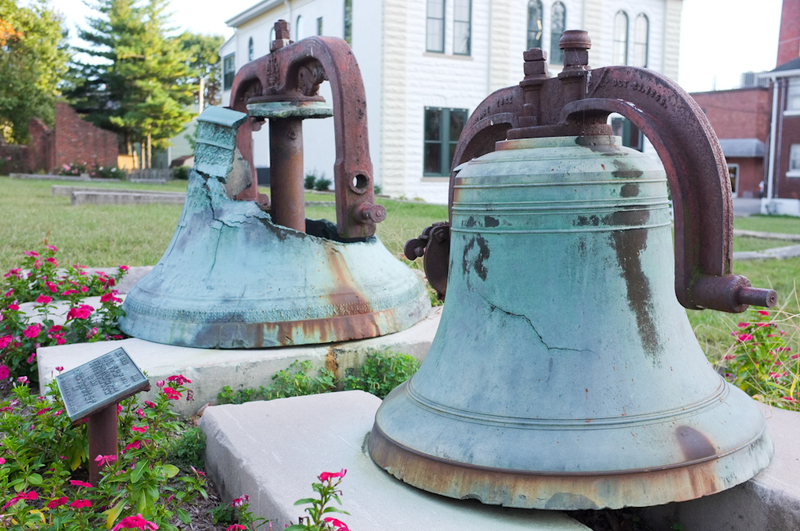 In 1865, Father John Mougin blessed two bronze bells in a special ceremony. During the December 29, 1975, fire, the bells fell from the steeple and cracked on the front steps of the building. Following the fire, the Archdiocese of Indianapolis rejected plans to rebuild on the site. Holy Trinity parishioners joined St. Mary’s of the Annunciation and other Catholic churches in the area. Members of the former parish chose to allocate money from the insurance settlement for the construction of Holy Trinity Heritage Court. 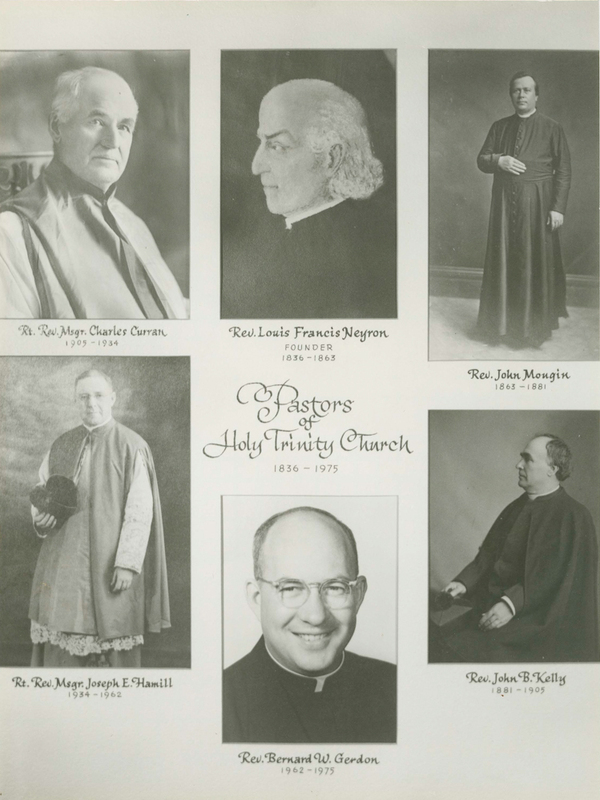 In April 1977, former members of the church helped plant 150 trees on the site to commemorate the parish’s history. Many of the former church buildings have been repurposed; the former rectory served as the location of religious agencies for thirty years. Recently, the St. Elizabeth Maternity Center completed a full renovation of the building to serve as its central office. 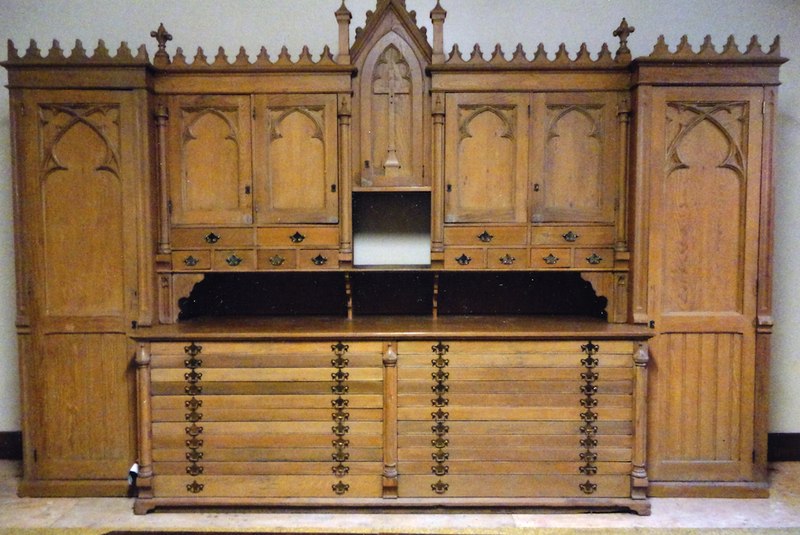 Carl Creason, Hannah O'Daniel, Katherine Gann, Daniel Michael, and Leanna Smith, “Holy Trinity Heritage Court,” Discover Indiana, accessed April 25, 2019, https://publichistory.iupui.edu/items/show/142. “Holy Trinity Heritage Court,” pamphlet printed by Holy Trinity Altar Society, Dec. 15, 1977, in Churches - Holy Trinity Church vertical file, New Albany-Floyd County Public Library.Courier-Journal, Dec. 30, 1975.The Criterion, Aug. 27, 2004. New Albany Tribune, Oct. 8, 1963. Holy Trinity Church, New Albany, Indiana (Chicago, IL: C. P. D. Corporation, [n.d.]), p. 3.Paul Sweeney, “Holy Trinity Church” (TS), Churches – Holy Trinity Church vertical file, New Albany-Floyd County Public Library. Published on Mar 9, 2016. Last updated on Apr 2, 2019.